I don't know how he's gonna take this, but when I think about my uncle Chick, I think about crabs. See, Chick lives in Long Island, NY, and his property backs up onto a canal. He's got a dock, where he keeps a small boat, and where you could hang around all day watching other people going by on theirs. But to see the best thing about my uncle's setup you need to look very closely. Tied to the wood railing that leads to the dock is a weathered and not very thick piece of line, which drapes down along a retaining wall and into the canal. At the end of the line is a crab pot. It's Chick's, and it gets a lot of action. Always has. Chick called me the other day to see if I could make it down for his annual Fourth of July feast. Which of course got me thinking about, well, you know. And so I did it my uncle's way. Just not with the blue crabs he uses, because I can't get those up here in Maine, I can only get the local rock crabs. I couldn't bear to cut into a live crab and so I steamed them a couple minutes and then cleaned the insides. And into the red sauce they went. Simmered for a couple hours at low heat. And thrown together with tagliatelle. Hope to see you this weekend, Chick. But if not I promise -- for real this time, I mean it, probably in July sometime -- to make it down for a boat ride this summer. And for some of your crabs. The one thing I knew that I had to grab at the Saturday farmers' market was this broccoli rabe. See, I'd gotten some sweet Italian sausage from one of the vendors the week before, but hadn't been able to use them, and so into the freezer they went. The market was just lousy with garlic scapes, and so I picked up half a dozen for a buck. The chopped up scapes, a little hot pepper and a few anchovies get going in the extra virgin. With the orecchiette, and a sprinkling of cheese, of course. 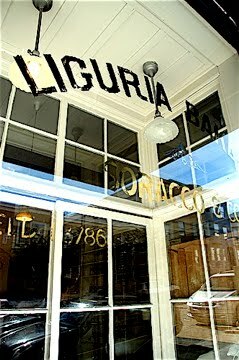 I knew when I first laid eyes on the Liguria Bakery that I would be back. Had to. It was closed. It happens at the North Beach focacceria. San Franciscans evidently know a good piece of pane when they eat it. As soon as the day's bread is gone, this bakery closes -- and the bread often is gone before lunchtime. So why is it that nearly every traveler I query about the almost hundred-year-old San Francisco jewel stares blankly at their (sometimes) fine footwear and then politely (also only sometimes) states that they've never heard of the place? 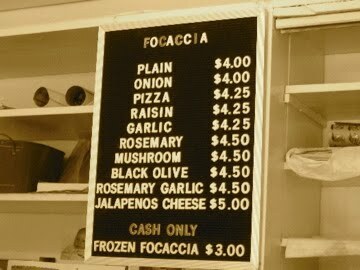 I found myself thinking of the focacceria just the other day when, for the dozenth time at least, I tried to convince a poet/playwright/shyster lawyer/yet all-around-good-egg friend of mine here in Portland to eat something that greatly reminds me of Liguria's product. Stephen Lanzalotta's Sicilian Slab is a thick, bready, tomato sauce-topped beauty dusted only slightly with cheese. It is my favorite "pizza" in town. "But it's thick," the normally level-headed lass again complained. "I only like thin-crust pizza." We'd been down this dark and narrow alley many times together. I was weary. And beaten. That was me. In a brilliant stroke. For the Slab is, to me anyway, more overloaded focaccia bread than pizza. 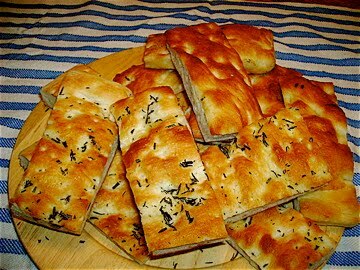 Me: "Think of it as focaccia then, because that's really what it is." She: "Oh, now, that helps. Why didn't you just say so?" Back to the other coast. After stumbling upon the closed bakery during a meandering stroll of North Beach, I returned at around 11:30 a.m. the next day. 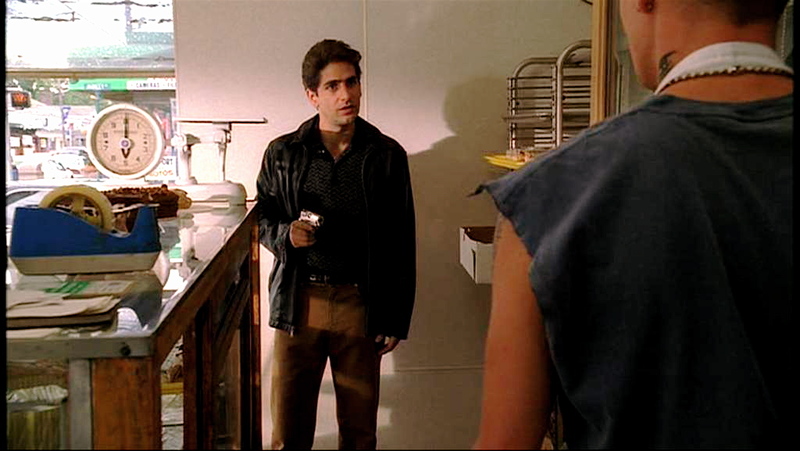 The bakery is like no other: there isn't an edible morsel of food in sight to taunt you, not a single one. There's a counter, a lady, a menu board. That's it. The bread, which is the only thing they sell here, is out back; order it and the lady will fetch it and wrap it for you to go. Don't order it and you will go away not just empty-handed but without even laying your travel-weary eyes on something good to eat. I ordered the "pizza" focaccia, the only one available with a red sauce. 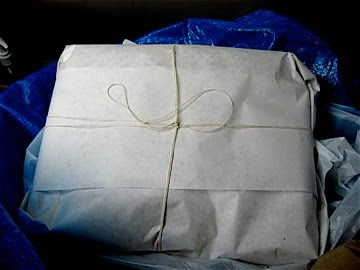 The lady went and got my slab, packed it nicely in white paper, tied the paper package in string, which was also white, and handed it to me in a manner that could not have been more casual. The idea of carrying it back to the hotel crossed my mind, but I opted for a park bench in Washington Square, just across the way. As soon as it was unwrapped I knew that I was hooked. 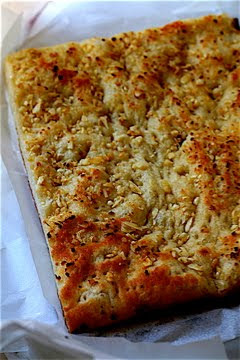 It reminded me of my first taste of real Italian pizza -- focaccia -- eaten fresh from the oven at a bakery (also stumbled upon) in, coincidentally, the Liguria region. And so alone on that park bench, on a lovely spring day in California, I ate the pizza. I loved the pizza. Then I walked back to the bakery to get some more of the pizza. But it had already closed. It's been a couple years since I was in the Bay Area, and so I'll rely on others' photographs, strewn about the web, to fill in the rest of the story. Many thanks to my fellow food lovers who've documented the goings on at this very special -- and not at all changed by time -- San Francisco gem. Next time you find yourself in That City by The Bay, take some advice from the man made of meat and give it a try. This is the menu -- the whole menu. Tell me this is not a beautiful thing. The rosemary and the plain. 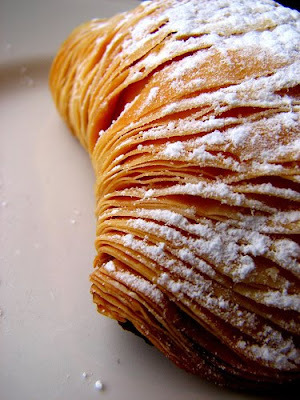 Liguria Bakery is at 1700 Stockton St. (at Filbert), San Francisco, CA, 94133; 415-421=3786. Open until 1 p.m. Monday through Saturday, noon on Sundays, or until the doughy stuff runs out. I was minding my own business last night, blogging the furthest thing from my mind (imagine that! ), when all of a sudden a pretty good concoction winds up on my dinner plate. Simple stuff here, folks. Took a nice piece of swordfish, rubbed it with extra virgin olive oil, a little salt and pepper, then coated it with cornmeal and shoved it in the oven. On the side is a combination of roasted vegetables I do a lot: cabbage, carrots, red onion, garlic (of course) and some hot pepper. 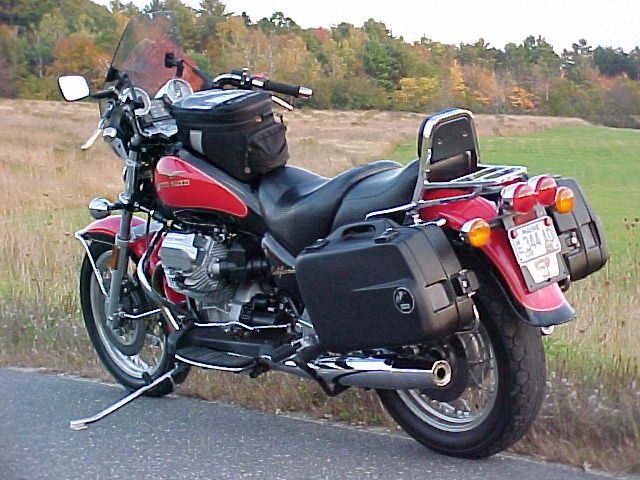 Beautiful day here in Maine and so me and the Gootz are off on a ride. There is a perfectly good explanation for eating an Easter pie in June. And her name is Aunt Anna. Every year, Anna makes an extra meat pie just for me. It's not that I'm so special (she will be the first to tell you this, I am sure), it's that I'm rarely able to make it to Easter dinner with the family and she feels (strongly, lucky for me) that I should not entirely miss out on the fun. My dear aunt knows that it could be awhile, months perhaps, before I can retrieve my pie. 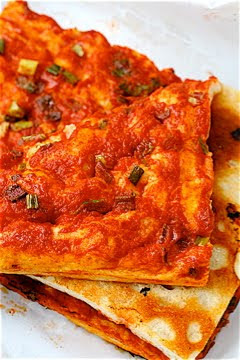 It comes out of her oven, cools on a rack near the terrace that faces east and therefore to me, gets tightly packed and fast frozen, then sits in her small freezer until her (devoted) nephew comes and gets it. Doesn't matter how long it takes for me to show up. Or how many other family members might covet this frozen treasure. It's my pie. Because Anna made it for me. End of story. This is a love I wish for you all. Anyways, I went and fetched said Easter Meat Pie (aka Pizza Rustica, as well as a bunch of other things) last weekend, and thought you might enjoy a look. The recipe's below, but this is all meat, cheese and egg. The red stuff is not -- I repeat, not -- tomato. It is pepperoni, something I don't usually seek out, but here it is most welcome. Anna said that I could write about her pie and reprint the recipe (her exact words, if memory serves, were "go ahead, whadda I care") as long as I did not include a picture of her. Reluctantly, I agreed. This recipe will make a few pies, depending on how big you make them. Optional, though highly recommended final step: Let one pie cool thoroughly, wrap tightly, then place in the freezer, leave a Comment for yours truly with your location and convenient time for a pickup. I'll get there just as soon as I can.